Large volumes, a vast portfolio and competitive pricing are the hallmarks of José Neiva Correia and his DFJ Vinhos, the leading Portuguese company in the English market. As for cork stoppers, the natural ones are and always will be, the most adequate stopper for Great wines, the so-called ‘staging wines. 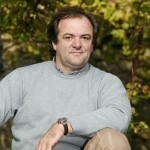 It is said that he is one of the oenologists who more wine signed in Portugal, having been a consultant for several brand. “Over three hundred wines”, he says, without false modesty, José Neves Correia, 57 years old, owner of DFJ Vinhos, the Portuguese company who has the largest share of the English market, the equivalent to one and a half million bottles exported annually. As a matter of fact, in DFJ Vinhos, volume and diversification of supply are the watchwords of a business whose main objective is to achieve the best value for money in each of its products, so as to keep its clients always satisfied. “When I am asked to define my wines, I usually say that if I was a car manufacturer, my aim would be to produce Mercedes at the price of Volkswagens and, eventually, Skodas”, José Neiva insists. With twenty five brand and sixty four different wines, from all Portuguese regions, from the Douro to the Algarve, DFJ only doesn’t produce vinho verde and fortified wine. Interestingly, despite the dimension of his annual production – 3.5 million bottles – he does not own any vines, he only vinifies; getting his raw-material from several farmers throughout the country. The company transfers 90% of its production to external markets, the equivalent of 3.2 million bottles, and a big majority of these brands directed to a medium/low segment and at very competitive pricing. His regional red Estremadura Ramada, for example, is leader in the English market, while other reds from the same region such as Portada and Manta Preta are already references with tradition in Scandinavian markets, representing 15% of the exported volume. The state monopolies of Canada absorb another 15% of the total regional wines of Estremadura and Terras do Sado and, at a lower scale, DFJ is also present in the USA, as well as other European countries. Both the Ramada and the Portada – the two wines with the lowest price – represent 40% of the total production of the company. Finally, to this vast portfolio we can add the roses – Ramada, Casa do Lago and Grand´Arte – “more and more fashionable” and, with a higher positioning, reds and whites of a high-range: Grand´Arte and the premiums DOCs of Alenquer, Ribatejo and Douro, and a super premium to be launched this month in the national marker, Francos Reserva. Son of father and mother winemakers, both owners of land in Alenquer and Torres Vedras, José Neiva Correia was born and raised in this environment. Even today, along with his brothers, he owns Rui Abreu Correia e Herdeiros, a family business owner of 200 hectares of vine, one of the biggest properties in Estremadura. An Agricultural Engineering Technician, he started an internship in the National Centre for Wine Studies, later performing refinement stages in Bordeaux, France and in Germany. In 1998, he was already a renowned oenologist in Portugal, working as a consulter for several companies, one of which D&F Wine Shippers, the biggest Portuguese wine imported in the United Kingdom, when he decided to associate himself to the owners. To the “D” of Dino Ventura and the “F” of Faust Ferraz, he added the “J” for José, and DFJ Vinhos was born. But, in 2005, he became the sole proprietor, since with the death of one of the partners; he chose to buy the entire share capital of the company. Headquartered in Vila Chã de Ourique, close to Santarém, a little more than half an hour from Lisbon, DFJ Vinhos occupies what once was one of the most famous and vast estates of the southern area of the country, Quinta da Fonte Bela, an impressive group of buildings of unusual features to the region, a mix of French châteaux architecture, with the Marseille tiles and traces of industrial architecture, judging by the impressive chimney that can be seen several kilometres away. It was in this place that António Francisco Ribeiro Ferreira, one of the biggest landowners in Portugal, produced, in the end of the Nineteenth Century, the brandy used for the production of Port wine. Little by little, José Neiva has recovered the several facilities of the Quinta, nine pavilions in total (around 7000 m2 of covered area) between warehouses, furnaces, distilleries, the huge wine cellar still in use with a capacity for 2.5 million litres; as well as another one, not in use, but which is considered the biggest cellar for wooden wine casks in the country, today used to stage wine in oak barrels of French, Portuguese and American oak. 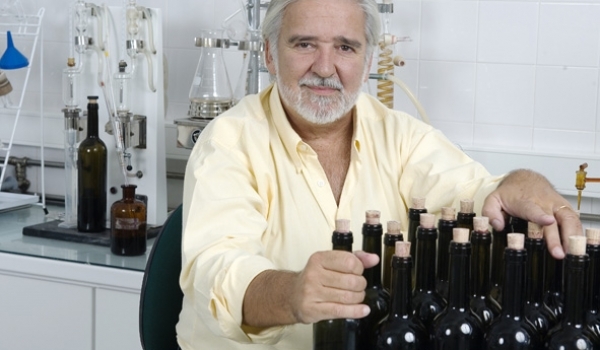 Always attentive to the demands of the market, José Neiva knows that the stopper in each bottle is an essential factor in meeting the objective which should be the ultimate one for any winemaker: the complete satisfaction of the consumer when tasting his wine. In fact, over a decade ago, he developed and patented a cork disinfection method through ozone (which he then sold to Grupo Amorim) and which contributed to the decrease of RCA (Tricloroanisol compound which causes the so-called “musty smell”). 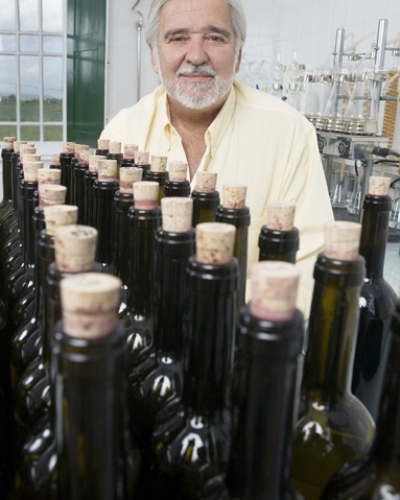 Despite its low price and high success rate, due to the increased research in this area, all technical cork he uses to seal his annual production are treated by steam distillation, an innovative technique which “can considerably reduce the TCA incidence”, he explains. “I only use natural cork stoppers in my high-end wines, red or white – DFJ Varietais and Bivarietais, Grand´Arte, Francos Reserva, Escada, Francos and Consensus –, because in all others, I use technical corks. Even when compared with synthetic stoppers and screwcaps, for big volumes as is my case, it is not only cheaper, but it is also by far the most appropriate stopper”. 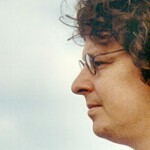 He adds, explaining in detail and with the scientific rigor of those who have investigated the problem, the reasons for his choice: “Of the three types of stoppers available, for wines of medium range and fast consumption, the best stopper is by far the technical cork, followed by the synthetic cork and the screwcap. This is because in both in the technical cork and the synthetic cork, there are gas exchanges which prevent the emergence of thiols (sulphur compounds which cause bad smells). As the screwcap completely seals, it does not allow the passage of oxygen which will eliminate these thiols, giving origin to bas smells in wines, generally one year after bottling. This situation does not occur as frequently with the technical cork or with other synthetic stoppers. On the other hand, the elasticity of the cork agglomerate is much bigger than that of a synthetic stopper, adapting itself perfectly to the bottle neck. In the case of synthetic corks, a slight millimetric difference in the bottle neck is enough for the whole bottling to be ruined, originating in premature oxidation”. José Neiva also refers that these types of situations have frequently occurred with synthetic corks and, only in one case or another with technical corks, proving his point. As for natural cork stoppers, he has no doubts whatsoever: they are and always will be, the most adequate stopper for Great wines, the so-called ‘staging wines, which are preciously kept along the years, waiting for the right moment to be enjoyed.